Living the 5GLife includes discovering the pathway to Extravagant Generosity, one of the five fruitful practices of Christian discipleship.. Unfortunately, instead of living in an extravagantly generous culture, we live in an extravagant consumer culture where things represent success, love, and security. We are encouraged every day to become extravagant “spenders” with credit cards we can’t pay off and emergencies we can’t respond to without further borrowing. The American dream can quickly become a nightmare. 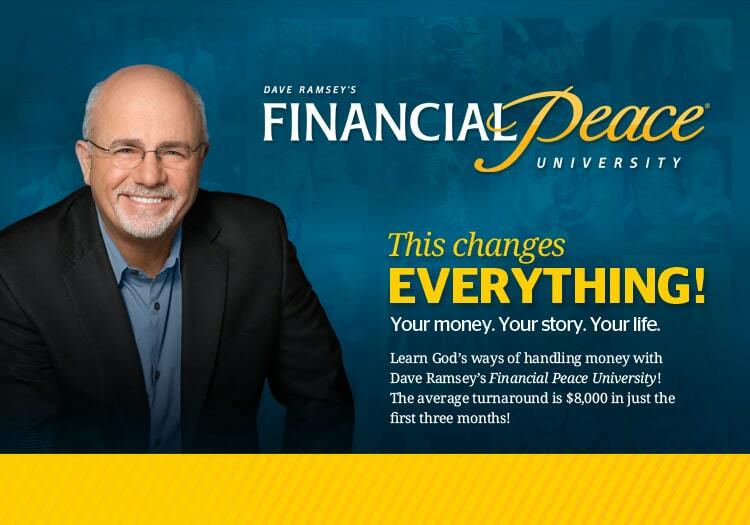 Trinity Presbyterian Church offers Financial Peace University created by Dave Ramsey specifically for faith based communities several times a year. Classes meet for nine consecutive Sunday evenings led by Trinity member Bud Ward. Bud is a retired partner with Ernst & Young and has attended the full Financial Peace University course in preparation for leading the Trinity group. The primary presentation each meeting is a video featuring Dave Ramsey and his associates. The videos are fast paced and informative. The cost is $85 per family unit if you register through Trinity Presbyterian Church (If you register through the Dave Ramsey Financial Peace University website it will be $93.00 plus shipping.) You will receive an audio copy of all nine video presentations by Dave Ramsey, a book, Dave Ramsey’s Complete Guide to Money, a budgeting workbook, an envelope system for maintaining a budget, and memory guides. If you must miss a class, these materials will keep you caught up with the class. And you are welcome to join the class for free if you have already bought the materials once. The next offering of this class begins on Sunday, April 28th, 2019 in the TPC library from 5:30 to 7:00 p.m. The class will meet for nine weeks from April 28th through June 30th. There is no class on May 26th due to the Memorial Day Holiday.